PRODUCT DESCRIPTION: Odorless concentrate labeled for use in and around homes. Easily mixed with water. TARGET PESTS: Many pests for both outside and inside the home. Also labeled for use on dogs, cattle and other animals for lice, ticks and fleas. WHERE TO USE IT: It is labeled for use on carpets in homes, furniture, cabinets, pantries. It's also for use outside in the yard and around the foundation of the home for perimeter pest control. Labeling also allows for it to be applied to pets and clothing as a pest repellent. RATE OF APPLICATION: Generally for most insects, 4 ounces to a gallon of water will work although a more concentrated mixture may be made. One gallon will cover up to 800 sq/ft. When using as a clothing soak, mix 2 oz per gallon of water and let garments sit overnight and then allow them to dry before wearing. When using as a pet or livestock dip, add 2 oz per gallon and sponge or spray on animal to keep away fleas, ticks and biting flies. I have an invasion of straw itch mites all over my home… It is terrible and I hate to be at home. I ordered things in the past. I really need your professional advice. You can't even use the bathroom with out an attack on the body… Tell me what I need to treat this for a period of time. I am cleaning now to prepare. My husband works for City of Norfolk, doing board ups, properties with very high grass, rotten trees needing removed, cutting boarded homes or unkept properties grass. We also own a Lawn Care Business.. I believe his vehicles and shop is infested, and his dog. Please HELP!!!!! I am looking forward to hearing back from you ASAP…Thank you.. In the article you'll learn all the options we have for treating the yard and home. In general, most people will start with Deltagard Granules for the yard and spray over the top with Permethrin. This will get control outside the home. Next, they'll treat inside using the Permethrin for all carpeting, furniture, etc. It's odorless and can be used as often as you need. Typically people will treat once a week until the problem is gone and then 1-2 a month to keep it under control. The Permethrin you need is above. The only other option that you might consider adding is Microcare aerosol. 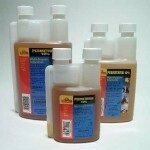 This product can be used in between having to spray the liquid permethrin. Microcare is a pyrethrin based aerosol and will kill itch mites on contact so you can use it daily if needed for small areas. 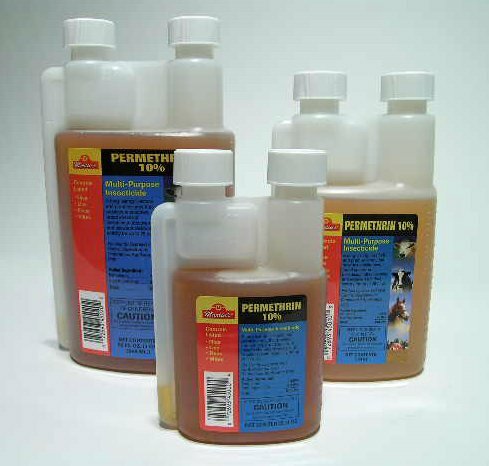 Question… I have had a bottle of Permethrin 10% in storage, unopened, had it a while. It now looks opaque and possibly gelled but have not yet opened the container. Does it have a shelf life? Can it still be utilized when mixed with appropriate portion of water for the sprayer? In general, most of our concentrated products will be okay for up to 5 years. But when you start to see a color change combined with any kind of coagulation, it usually means the material will no longer go into solution properly. And based on your description, I would say the container you own is well on its way to unusable. So even though it might still mix with water, you probably won't be able to get normal results or residual. Was told to use this to kill off copperhead snakes. I've read the label and no where does it say for getting rid of snakes. Will this work? I plan on using it regardless since I do have ticks in my yard. Thanks. I have confused flour beetles which are probably coming from the outside of the home. What product is most effecient in killing these pests? If you review our Confused Flour Beetle article, you'll learn what needs to be done. As you'll see in the article, we recommend Defense concentrate for use on the exterior of the home when this pest is coming in from outside. Defense can be used inside too but you may want to opt for the Phantom aerosol. It goes on dry making it ideal for use where you don't want to make a mess with any kind of liquid like in rooms with hardwood or tiled floors. You should also set up some Xlure traps inside to help monitor the situation. I have a terrible mosquito problem around my house. I've tried a bunch of things to no avail. I recently picked up a Burgess propane bug fogger and was wondering if you'd recommend trying a permethrin mixture and if so what ratios would be the way to go? Thanks! If you review our Mosquito control article, you'll learn all about the "best" chemical options to employ. First and foremost, if you plan on treating an area larger than 2500 with your recently acquired Burgess, I'm afraid you will find it barely able to handle the problem. And if you intend on treating 5000 sq/ft or more, I suggest you return the Burgess and get one of the units we have featured in our article. The big reason is that our machines are a lot more powerful and will take little time to use for large areas. The Burgess, on the other hand, will struggle to handle anything 5000 sq/ft or larger. The second reason is that you can use water based formulations with our machines but with the Burgess, you're limited to oil based mixtures only. This will prove to be quite costly over time which only reinforces the fact that using one of our machines is the smart way to proceed. As for concentrates; go with Permethrin, Pyrethrin and Nylar. I've carpet beetle larvae issue at home. I've been having a professional pest control in 7 times in the past year to spray my house. The situation got a bit better. But lately, I started seeing larvae again. Can you please recommend if I should use permethrin or defends? Can I spray it while I'm pregnant? Thanks. First, we always recommend consulting with your doctor before doing applications if you're pregnant. And you should have them advise whether a service company should be treating as well. In general, there should be minimal if any exposure when treatments are done properly but for some, avoiding any unnecessary exposure to certain chemicals may be required due to medical history, special conditions, etc. With that being said, if you review our Carpet Beetle article, you'll learn the key to solving this kind of problem is the use of a juvenile growth regulator. This will "interrupt" the developing larva and prevent them from becoming reproducing adults. For carpet beetle problems, this is paramount to solving the issue. So whether you treat or hire a service company, its important that both an adulticide like Permethrin or Defense be used combined with Nylar. And I recommend the Defense over the Permethrin if you've had an ongoing issue since it will last longer. And don't forget to set up some larva monitors throughout the home. They can help identify problem areas you may be missing with the spraying being done (which would explain why the problem persists). No one left! Used the product with a pump sprayer to complement the D Force used for the weevil infestation that had taken over our food closet. It was sprayed around cracks and crevices around the house as somehow some had found their way to the second floor for some reason. It has been a devastating result! No ants, weevils, even mosquitoes, have fallen under the power of this product. It was mixed at a rate of 3 oz. per gallon of water. Really is odorless. Have been using permethrin to treat clothing for chigger and tick repellent. Stuff I had before smelled bad. This stuff has no odor that I can detect. Mixed it with water to 0.5% concentration and sprayed on clothes. I have no pets but discovered a flea infestation in my basement. I had a raccoon get in my house and I assumed they came from it. I was able to research what I needed to kill the live fleas and the eggs. So far has solved my problem. I will probably treat again in a month to get any stragglers. Price of product was reasonable. My first experience with these products. Very pleased with the results thus far.